Nixon Motor Sports: Need a Used Car? Used by 2 World Champ Drivers with 10 World Championships? Need a Used Car? Used by 2 World Champ Drivers with 10 World Championships? If you need a spare car, you know, just for tooling around on the weekends, specifically on a track at a high speeds, you might want to check out the little beauty in the story below! 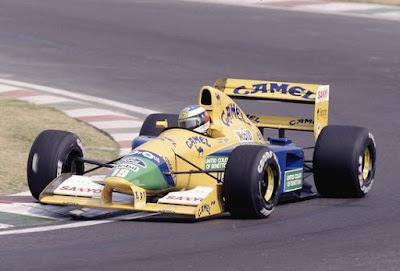 Going up for auction on May 13th with NO RESERVE, this is a Formula 1 Ford Benetton race car that was race driven from 1991-1992. A "No reserve" auction is auctioneer talk for "we'll sell it for the highest bid no matter what it is, even if it's ten cents... but we really think it will go for $200,000.00 or more". What's up with the 10 world championships? Well, this particular little model (would look great in your garage by the way), was driven in 1991 by 3 time champ Nelson Piquet, and then driven in 1992 by a new member of the Benetton squad, a certain Herr Michael Schumacher from Deutschland, who would go on to win 7 world championships of his own! That little pedigree, combined with the fact that this particular automobile was also raced by 0 time world champion (but still famous F1 British TV commentator) Martin Brundle, makes this a very cool car indeed. "Hey honey, could you run to the store and pick up some milk?" takes on a whole new meaning when you know you could accomplish the task in a V8 730 horsepower fire-breathing F1 car!